What does finalist mean? A finalist must be outstanding in what it does. Organic Chemistry was the only science resource selected that year. Does this mean that mean organic chemistry is good? Better. 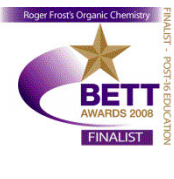 It means Organic Chemistry by Roger Frost is recognised as outstanding.